AmeriGlide Scranton Wilkes-Barre is part of the nationwide AmeriGlide family – a specialist retailer and supplier of the best mobility and disability products, all at great prices! We sell innovative products including lift chairs, mobility scooters, bath lifts, stair lifts, wheelchair ramps, and much more. 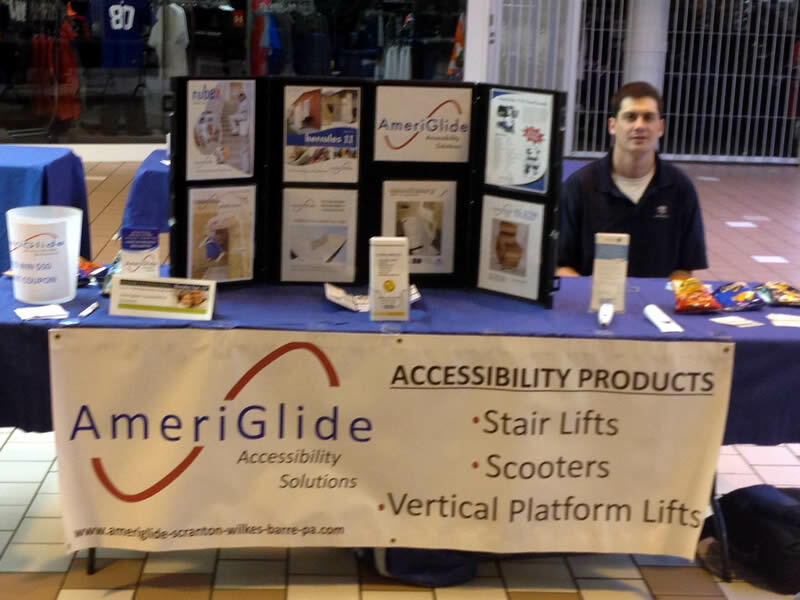 In fact, AmeriGlide has everything you need to make your home or business safe and accessible for people with additional needs. The friendly and knowledgeable team members at the AmeriGlide Wilkes-Barre store are always happy to help answer any questions you might have, so feel free to walk in to the store for a no-obligation consultation and product demonstrations. All the devices we sell in store are also featured on the regularly-updated AmeriGlide Scranton Wilkes-Barre website, so take a look around or visit us at 1335 Route 315 Plaza #2, Wilkes Barre, PA 18702. Transport yourself upstairs and downstairs with comfort and ease! With an AmeriGlide stair lift all you have to do is sit, and the chair lifts you up the steps. AmeriGlide manufactures the only stair lifts specifically designed for home owner installation and the only stair lifts that include a 5 year warranty. With prices starting at just $1349, AmeriGlide is also the least expensive stair lift available today. AmeriGlide has a variety of different vertical platform lift models, including vertical platform lifts for the home and workplace. We have portable lifts available too! Do you find it difficult to get in or out of your bathtub? Purchase and install an AmeriGlide bathtub lift for pain and worry-free bathing. An AmeriGlide walk in bath can make bathing safer and easier – rediscover the pleasures of bath time with an AmeriGlide Walk in Bath. Looking for a lift chair retailer? AmeriGlide lift chairs offer the best value for money you can find, and are all fully customizable! If you have reduced mobility, you know how difficult it can be to get around independently, so why not invest in an AmeriGlide mobility scooter? Living in a multilevel home doesn’t have to be a problem for wheelchair users. Learn more about the AmeriGlide Elite Residential Elevator here on our website.